This story is a part of our Map to the Middle Class project, where readers ask questions about educational pathways to financial stability and then we investigate. This question comes from Kirk Warren, of Reno, Nevada. Kirk asks: “Where are the effective high school tech & trade programs in the U.S. and how are they funded?” To submit your question or vote on our next topic, click here. WAYNE, N.J. — Jalal Abaza has a 3.9 GPA and loves fixing broken things. He’s a senior at Passaic County Technical Institute, a public high school in New Jersey that offers work-based learning programs in fields ranging from business and applied technology to construction and cosmetology. Abaza spends mornings in a classroom, studying automotive tech, and afternoons at a local BMW dealership, repairing cars and earning $10 an hour. Abaza — whose father, a bus driver, and mother, a department store manager, came to the United States from Syria in the 1990s — is on track to graduate from Passaic with two valuable automotive industry certifications, making him immediately hirable. He will have a year’s worth of hands-on workplace experience — a rare commodity for a recent high school graduate and a big step in determining if a career in that field is a good fit. He will also have an established relationship with a dealership that is interested in bringing him on full-time. Academically, he will be ahead of the game: While the minimum graduation requirement in New Jersey is 120 credits, Abaza and his classmates will graduate with a minimum of 167 credits, a requirement at his school. The county-based programs for high schoolers are so popular that of the nearly 30,000 young people who applied for spots in the programs in 2017, only about 13,000 students received a seat. Vocational education programs like those offered at Passaic (known to students and staff as “Tech”) are particularly well-positioned to prepare young adults for the labor market of the future, according to some workforce and education experts. In recent years, good jobs for people with only a high school diploma have dwindled, while positions that require both technical skills and an associate degree or some college education are multiplying. And there aren’t enough trained people to fill them: New Jersey, like other states, is facing a looming shortage of skilled workers in fields including manufacturing, logistics and distribution, transportation and healthcare. If that employment picture doesn’t change soon, some experts say, it could hamper economic growth. 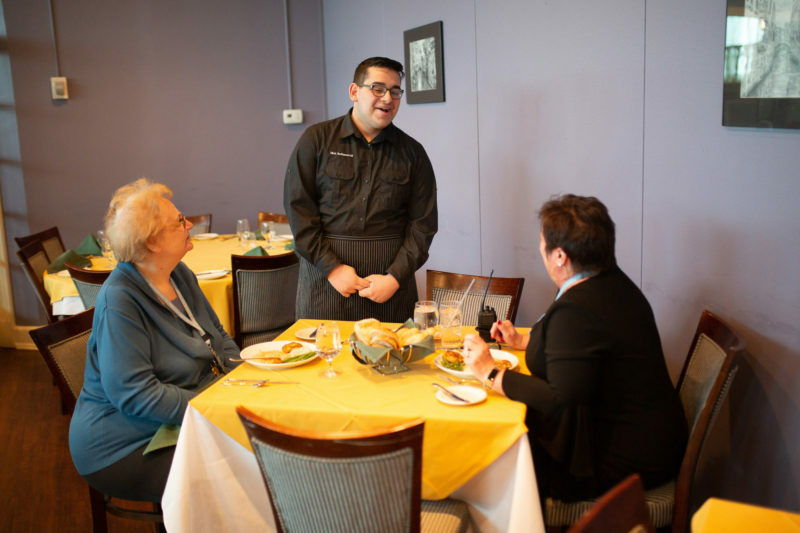 As policymakers seek to help more young people get well-paying jobs that require specialized skills, they are increasingly turning to models like New Jersey’s. Vocational education was once seen as a dumping ground for students who couldn’t make the cut for college, but New Jersey’s 66 county-run career and technical schools integrate work-based training with rigorous academic coursework to prepare students for both college and careers. The schools include large institutions like Tech that ready students for a variety of professional tracks, plus highly competitive “academies” that are built around a single field of study, such as medicine. Graduation rates at the schools top 97 percent — compared to about 91 percent statewide — and more than three-quarters of graduates continue on to college or other post-secondary education. The model is also notable because the schools are run by county governments, not school districts. This close relationship with county leadership gives schools a direct connection with local businesses, allowing them to be nimble and responsive to employers’ needs. And they are popular: Of the almost 30,000 teenagers who applied for spots in New Jersey’s vocational programs in 2017, only about 13,000 received seats. But in an effort to create a variety of programs to attract a range of academic achievers, the county-run model’s admissions process has produced a stratified system in which some of the elite vocational academies enroll a student body that’s significantly less diverse than the population of the schools’ home counties. This isn’t the case at Tech, but it is occurring at some of the academies, which require an admissions test. It’s a challenge that administrators of the programs are just beginning to grapple with, and it is emerging as New Jersey faces a legal battle over segregation in its traditional public schools, which are among the most racially divided in the nation. If New Jersey can address the issue, education experts say, its approach to career education could be one that other places will want to emulate. In the past few years, Tech has hosted educators and school administrators — eager to observe the school’s approach to career and technical education — from Ohio, Pennsylvania, New York, West Virginia and Maryland. Tech is located on a sprawling 55-acre campus with tidy lawns and modern buildings in Wayne, New Jersey. 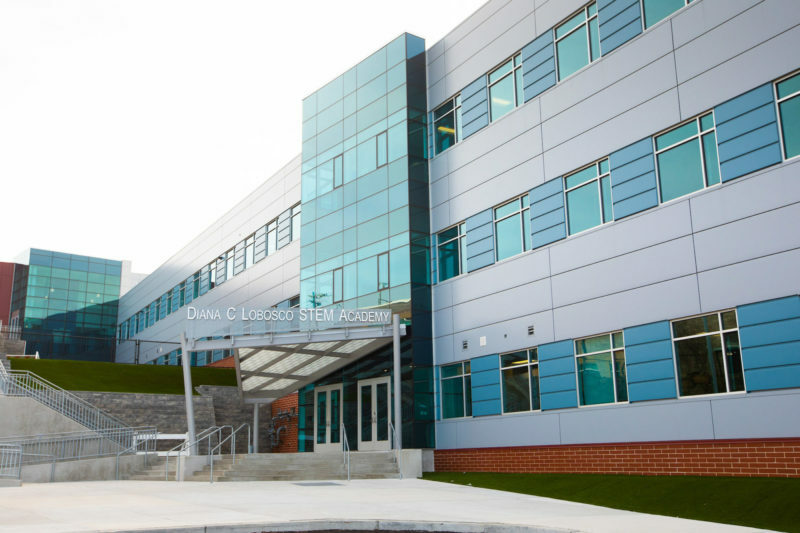 It draws students from some of the state’s poorest cities, including Paterson and Passaic, and it is not only New Jersey’s largest career and technical school but, with 3,475 students on one site, it is also the biggest high school in the state. Because Tech answers only to its county, its administrators have a direct line to local industry leaders. These leaders keep the school in the loop on industry trends while, in return, Tech commits to turning out skilled graduates, prepared to fill the local job pipeline, either fresh out of high school or after further education. Mitchell Hidalgo, 17, a native of Paterson whose parents both work in factories, came to Tech seeking training for a well-paying, in-demand career. Today, when she pictures her future, she envisions an electrician’s license and her own business. She works half days for a local electrical contractor through the School to Careers program in which Abaza also participates. In a few months, she’ll graduate from Tech and work four years as an apprentice before earning her license. She knows the next few years will be tough because of the many skills and rules she’ll be expected to master, but she also knows she has no interest in college, preferring to work with her hands and see the tangible results. “I’m the only female at the company, and in class, it’s just me and another girl among all the guys in the electrical shop. I try to use that as motivation to keep going and show others it’s OK to do things that aren’t expected of you,” Hidalgo said. 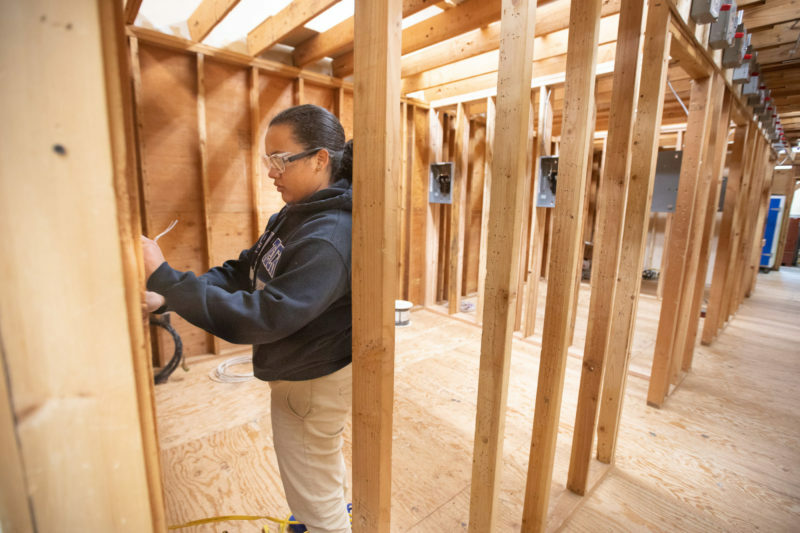 After she earns her license, she’ll enter a heavily male-dominated trade: As of 2016, 97.9 percent of electricians are male. Tech does not have an entrance exam and evaluates students based on grades, standardized test scores, attendance and discipline records. The school accepts only about a third of the students who apply, and it is more diverse than its surrounding community. 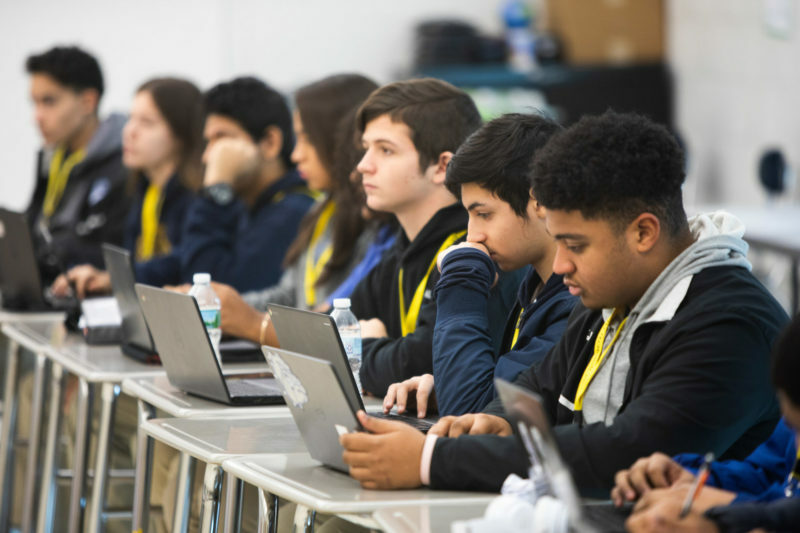 This school year, about 53 percent of students at Tech are Hispanic, 19 percent are white and 10 percent are black; Passaic County is 42 percent Hispanic, 41 percent white and 15 percent black. Just over an hour’s drive from Tech, near the Jersey Shore, Monmouth County’s Academy of Allied Health and Science is home to some of the state’s highest-achieving high schoolers. It is a prestigious high school designed to prepare an elite group of students for higher education and careers in the medical sciences. Though it is a county vocational school just like Tech, it ranks among the state’s top 10 high schools and, along with some of New Jersey’s other elite vocational academies, has a student body that is significantly less diverse than parts of the county it is located in. Like Tech, much of the academy’s success lies in its close relationship with local industry leaders who open their doors to academy students, exposing them to on-the-job training. These relationships are carefully nurtured by school staff — and aided by geography. The Academy of Allied Health and Science is next door to the Jersey Shore University Medical Center in Neptune, a teaching hospital that regularly hosts academy students through an intensive mentorship program. Starting freshman year, long before her students enter the glass doors at Jersey Shore University Medical Center, Maureen Baldaccini drills her high schoolers on technical skills ranging from CPR and automated defibrillator use to infection control techniques. These are bundled with soft skills such as how to speak with adults, ask questions and dress appropriately. 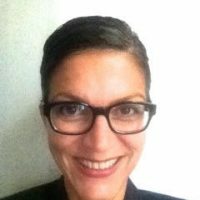 This is how Baldaccini, a nurse and the academy’s senior mentorship coordinator, ensures that the hospital will continue welcoming her students, allowing them workplace learning opportunities that will pave the way to competitive universities and, eventually, lucrative careers in the medical sciences. In the last four years, her graduates have been offered spots at schools including Harvard University, Yale University and the Massachusetts Institute of Technology. New Jersey’s first county academies were established in the early 1990s to attract high-achieving students who wanted to explore careers that differed from those offered by traditional vocational schools, in areas such as marine science and aerospace engineering, said Judy Savage, executive director of the New Jersey Council of County Vocational-Technical Schools, a nonprofit that represents the state’s 21 county-run vocational districts. “The term ‘academy’ has gotten people to think in a different way about career and technical education, leaving behind some of those old ideas about vocational schools where you send the non-college-bound student so they can have some kind of skills or trade,” she said. But the academies’ approach to admissions contributed to racial and socioeconomic disparities. In selecting students, academies rely on a special admissions test plus student standardized test scores. (Tech, by contrast, has no entrance exam.) In some cases, the academies have significantly smaller shares of black and brown students than their surrounding counties. While Bergen County is almost 20 percent Hispanic and 7 percent black, the student body at the Bergen County Academies was only 1 percent black and 6 percent Hispanic last school year. Bergen County is almost 20 percent Hispanic and 7 percent black, but the student body at the Bergen County Academies was just 1 percent black and 6 percent Hispanic last school year. Administrators acknowledge that ensuring a diverse mix of students is a challenge. Some of the academies, including Monmouth, try to achieve some diversity by reserving one spot for the highest-scoring student from each of the school districts in the county, so kids from low-income communities are assured seats along with those from affluent areas. “It’s something all of our schools are talking about: How can we recruit better and are there things we can do to help more students be prepared to enter these programs,” said Savage, of the New Jersey Council of County Vocational-Technical Schools. But so far, options like those being considered in nearby New York City — where the mayor proposed scrapping an exam that determines admission to the city’s eight elite specialized high schools — aren’t on the table. Meanwhile, school segregation is a problem statewide: Last May, civil rights groups and students filed a lawsuit calling for New Jersey to integrate the traditional public school system, which is sharply divided as a result of decades of discriminatory housing and zoning policies. For those who are able to secure a spot, four years of career and technical education in New Jersey’s county system can illuminate a future path — or change a student’s direction. Nick Buttacavoli, 17, a Tech senior, enrolled dreaming of a career in the culinary arts. But four years spent learning the ropes in the school’s kitchens yielded a realization: “I really want to go into law instead, maybe with a minor in business,” he said. He’s prepared for that as well, thanks to the school’s dual focus on academics and careers. Buttacavoli works at Tech’s in-house dining room, Chez Technique, which is staffed by students from Tech’s culinary arts program, with a chef instructor overseeing things. Watching Buttacavoli chat with school administrators while refilling water glasses, one arm tucked formally behind his back, Szczawinski, the curriculum director, looked pleased. 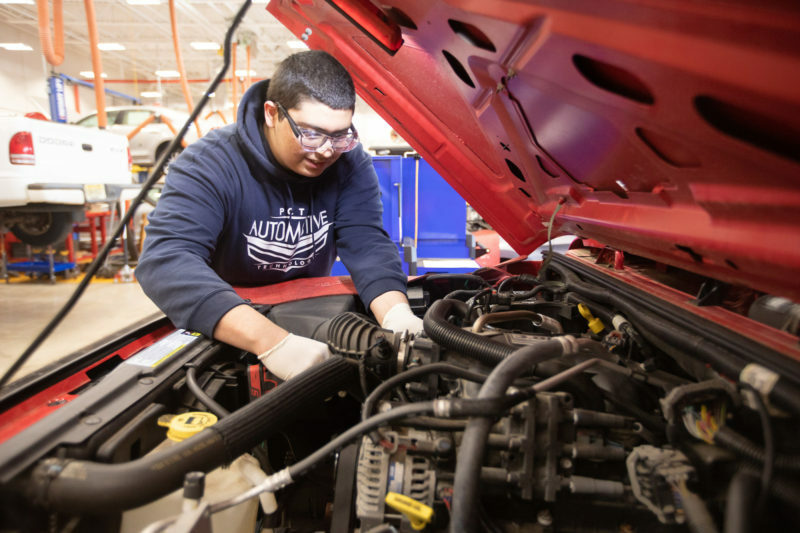 This story on vocational high schools in NJ was produced by The Hechinger Report, a nonprofit, independent news organization focused on inequality and innovation in education. Sign up for Hechinger’s newsletter.